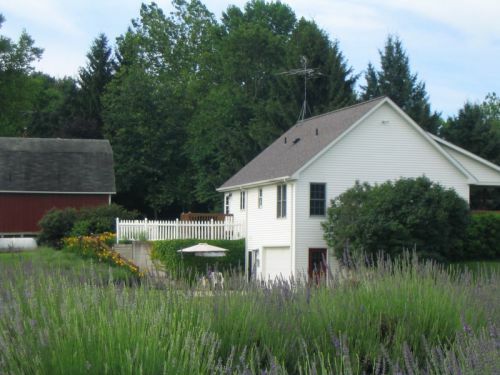 Lavender Hill Farm of Niles, Michigan (est. 2001), is located in the scenic, rolling hills of Berrien County in southwest Michigan. Come visit our farm during lavender season for an amazing sensory experience; a symphony of fragrance and color accompanied by singing birds, buzzing bees and baaaing sheep. Relax under our shade trees, take part in crafting classes, browse our gift shop filled with our wide variety of fragrant and beautiful lavender products. Enjoy our lavender field featuring eight varieties that bloom in sequence from late June until late July providing an ever-changing palette. We specialize in growing and selling lavender flowers and plants, and our farm-made lavender products, featuring our sensational lavender honey and our farm-distilled lavender essential oil and fragrant lavender water. Lavender is an extraordinary plant with a captivating scent, beautiful demeanor, and a multitude of uses. Best known for its wonderful, calming and uplifting scent, lavender has many other beneficial uses. Many people are still unaware that lavender is a wonderful addition to many foods! It is increasingly being used in both sweet and savory dishes as well as alcoholic and non-alcoholic drinks! Come to our shop to find out more about the many ways to use lavender in cooking. Our farming philosophy is to grow things using the most natural means practicable. Natural means for fertilizing, pest and weed control are being increasingly implemented as our practices improve the soils. We are also working on ecological restoration projects on our 30 acre farm. A 2.5 acre native wildflower and grass planting and restoration was planted in Fall of 2008 to help create and preserve native pollinator habitat which is so important for our food supply. Each year we see more native wildflowers bloom, which we catalogue in photos on this site. We are continually learning and trying new things to help make the environment better for all. Group Tours? Please contact Martha for reservations! Our Farm Shop is open Saturdays in April, 10 am to 4 pm. Peak Lavender Bloom: Our eight varieties bloom in sequence from late June till late July. Our English lavender varieties are usually at peak bloom in the last week of June. Our 3 hybrid varieties peak about mid-July.